Gotta love “Jug” Earps. Now I gotta find myself a cool nickname. I’m not surprised. I know other comic-collecting folks because I’m in the hobby, but I don’t think I’ve run into other comic collectors in real life, or at least not since I was in middle school. But I’ve run into several sports memorabilia collecting folks in real life–I think there’s just a much bigger pool of people interested in sports than in comics. I know a lawyer who spends tens of thousands every year for his Boston Red Sox (bleagh) memorabilia hobby, and I have another friend who has bought some very expensive historic items related to the old Philadelphia A’s. 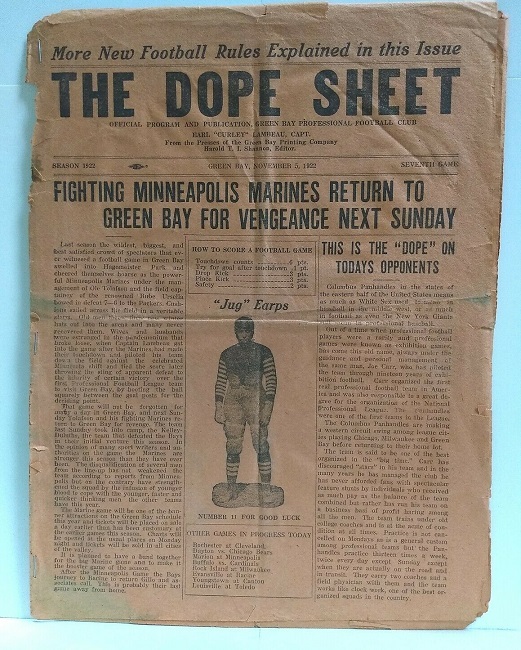 Combine that huge pool of sports collectors with a truly rare and eye-catching item for a team that has a rabid fanbase, and I can definitely see this going for $5K+. When I first saw you post this on Twitter, I thought this will go for thousands. Living in Minnesota (Home of the Vikings) and having such a big rivalry with the Packers, I knew there would be some intense bidding. Can you say if the item was sent to the midwest? The Packers are one of the few (maybe only team) that is owned by the fans.They sell stock for ownership of the team. Dp you have anymore to the story of how it ended up in California? Daniel T – Selling that on consignment for another customer. Yeah, I know, it’s weird. I am all for more “Mike’s Shipping Stories”. I’ve been doing some minor eBay selling myself lately so it’s top of mind for me.